Is Organic Apple Cider Vinegar Good for you? Every season, fashion changes and so do the fitness fads! Apple Cider Vinegar is a fad or the real deal? Here’s the answer! 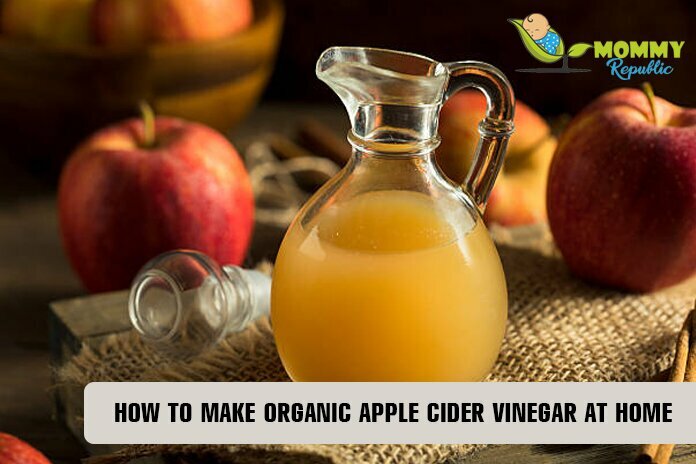 And an Organic Apple Cider Vinegar recipe which you can make at home. So, what is Apple Cider Vinegar? Raw or unpasteurized organic apple cider vinegar is of the most potent source of natural antibiotics. ACV is also one of the oldest home remedies known to man. ACV has many health benefits because it contains a host of raw enzymes and “good” bacteria. Why Apple Cider Vinegar is good for you? Hippocrates, Father of Medicine is known to have relied on Apple cider vinegar or ACV to cure a variety of ailments. Apple cider or apple juice is fermented and is high in vitamins like phosphorus, calcium magnesium and potassium. Hippocrates is believed to have prescribed ACV for a variety of ailments.Here are some which come to mind. Instead of relying on antacids and fruit salts like “Eno” for reducing acidity I usually have a shot of Apple Cider Vinegar. ACV is an acid, and it would be logical to assume that it would add to heartburn – rather than resolve it. But this is not the case. ACV has a valuable role in not only preventing heartburn but also in aiding digestion. Heartburn is usually caused by too little stomach acid – and this absence of stomach acid slows down our digestion process. The combined pressure of food and gasses put pressure on the stomach, and this causes the stomach contents, including the acid to run back up your throat. Drinking ACV during heartburn, increases stomach acids and helps digestion. ACV is the base of the Master Tonic which includes many naturally occurring antibiotics. Garlic, ginger, onions, horseradish and chilies are cut up and added to the ACV. All these natural antibiotics are then allowed to ferment together. It is a great remedy to help quickly knock out a cold. ACV is very healthy when ingested, but mommies will be happy to know that it does wonders for the skin as well. Adding it to your bathwater is an excellent way to restore your skin’s pH balance. Applying diluted ACV topically also helps to kill bacteria and fungus on the skin which cause eczema, dandruff, and other skin conditions. Using ACV has a conditioner, post hair wash also has great benefits. Since it’s good at pH balancing and preventing dandruff, it is good for hair rinsing and can be used instead of a conditioner. Drinking ACV for health is a new trend in India. As with most trends, many companies are trying to market their products to capitalize on this. Most of the ACV brands you’ll find in the markets are highly filtered, pasteurized and sold in plastic bottles! ACV with the mother in plastic bottles would do more harm than good!! Please stay away from these brands! While these versions are alright to use for cleaning, rinsing for fabric conditioners, and disinfecting – most of the health benefits are gone once “the mother” is filtered out. Pasteurized and filtered vinegar is devoid of the beneficial bacteria that develop during the fermentation process. Homemade Apple Cider Vinegar is the best, as you can be sure of the ingredients. I prefer to make it at home, but if you are short on time there are some good brands of apple cider vinegar in the market and the only one I like is Bragg’s Organic ACV. There are some other brands like Sattvic Foods ACV which is also good, but it’s not organic. Rest of the brands i have found to be selling in a plastic and PET bottle. While there are many food products I too am forced to purchase that come in plastic packaging – ACV is one you should avoid at all costs. This is primarily because the “mother” is still very much alive and fermentation is ongoing. Though using a cap does slow down the process, it doesn’t curb it completely. This means that the plastic in which you have bought or stored your healthy “ACV with the mother” is also leaching chemicals from the PET bottle. The best and cheapest way to consume ACV in my opinion is to buy one bottle of Bragg’s ACV and then start to make your own – at home! Do try out my recipe for making homemade apple cider vinegar! And don’t worry, even newbies can make it!! I mostly start my day with two tablespoons of ACV in a glass of water and raw Neem honey! During summers I make it into a delicious cocktail using watermelon juice!! How and why do you consume ACV? Share below! !